One million overhead tasks a year become easier thanks to a non-powered support gear. Working in a car factory in this current era isn’t too physically demanding, with robots doing pretty much all of the heavy-lifting. Yet, despite not having to carry so much weight, factory workers in Ford’s car manufacturing plants still do tedious and difficult work, considering how they have to perform overhead tasks repeatedly, up to 4,600 times a day or one million times a year. 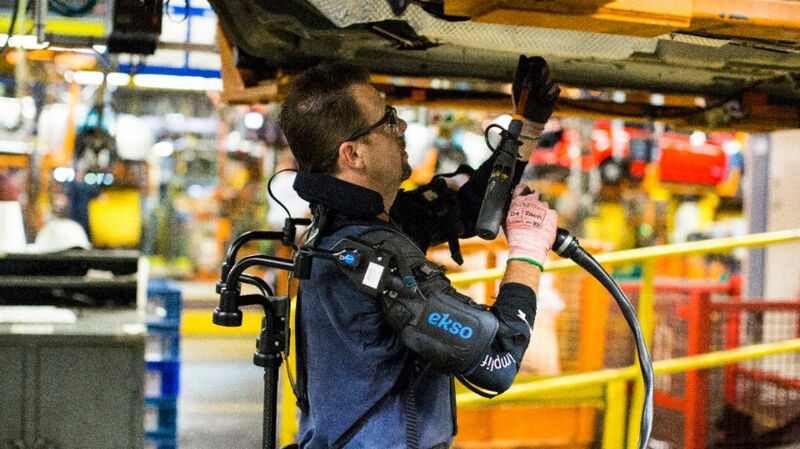 To ease this burden and lessen the chances of injury, Ford has partnered with California-based exoskeleton maker Ekso Bionics to trial a non-powered upper body exoskeletal tool called EksoVest in two of the carmaker’s U.S. plants. Designed to fit workers from five feet to six feet four inches tall, the EksoVest adds some 3 to 6 kilograms (5 to 15 pounds) of adjustable lift assistance to each arm. This exoskeleton is also comfortable enough to wear while providing free arm movement thanks to its lightweight construction. While this isn’t the first exoskeleton designed to assist the human worker, the EksoVest demonstrates how such tools can prevent injury due to fatigue and provide physically disabled individuals the opportunity to regain lost abilities. Already, exoskeletons are being used to help paraplegics walk, and applications for these technologies are even being expanded to provide support and enhancement for soldiers. The U.S. trial, made possible with the help of the United Automobile Workers, has already demonstrated the wonders that the exoskeleton can offer in reducing fatigue from high-frequency tasks. As such, Ford plans to expand their EksoVest pilot program to other regions, which include Europe and South America.